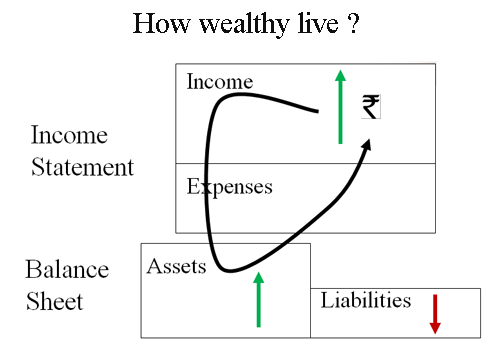 Home » Money & Wealth » How to become wealthy? 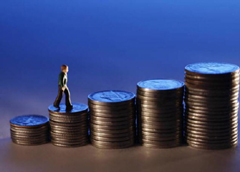 When it comes to wealth, people often struggle & spend their entire lives to become wealthy. Some of them can change wheel of fortune and becomes wealthy while other don’t. In this post we will suggest you proven way to become wealthy. Many people believe that “Being rich is being wealthy” this is not true; being Rich is about how much money you possess in a specific moment in time. Being Wealthy is about . . .
How much money you keep? How hard it works for you? How much is left for future generations? Being Wealthy is about exploding your Passive Income. (How long you can survive without ever having to go to work?). Million dollar question arise is that why only few people are wealthy? What other has to do to become wealthy? Let’s check out view of famous writer “Robert Kiyosaki “on this. What The Wealthy Teach Their Kids About Money That The Poor And Middle Class Don’t. It is not your boss’ / employer job to make you wealthy or secure. Their job is to give you a pay check . . . for work you have done & nothing more. You have to decide what you want to do with this money to become wealthy.First thing you must learn is how to drive this money. Biggest problem today is money drives most of us and we obey money. Probably it is because we are unable to drive money or maybe we are not smarter than our money? Do you want to work for money? or You want your money to work for you? When money works for you, every rupee is your employee & you can decide how to take work from it. You have to manage rupee in manner that every rupee works to bring you even more rupees while you’re asleep. Yes we are talking about power of passive income. Passive income is income by Interest, dividends, real estate, rent, royalties, stock market and annuities. Make investments that will bring passive income. Know the difference between an ASSET and a LIABILITY, and only buy assets. A True Asset will bring positive cash flow each and every month. Make your PASSIVE INCOME cover your Lifestyle Expenses forever. Buy assets first, luxuries last. If today you are unable to buy something ask yourself “how can I afford it?” This stimulates your creativity. Sadly, most of us have been taught to read words and books, but not numbers and financial statements. Two key personal and business financial statements we all must be able to read. The Income Statement shows the amount of money coming in and going out. The Balance Sheet shows the balance of what you own and what you owe. Let’s study Income statement and balance sheet of poor, middle class and wealthy people. 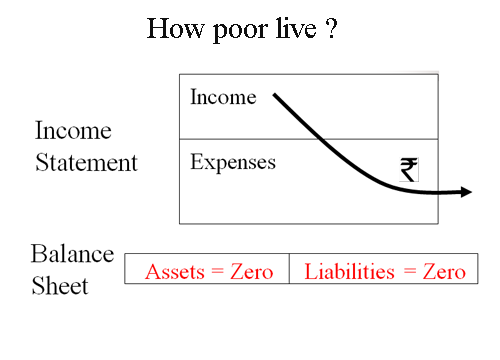 Poor have small incomes and small expenses. Assets are zero and liabilities are zero. 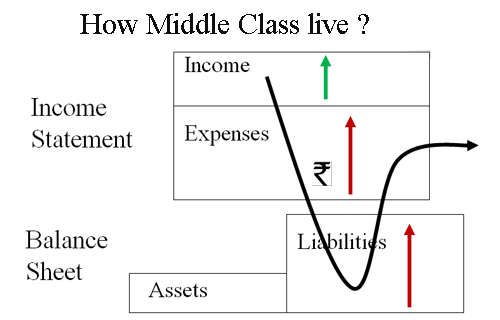 Middle class has stable income but they buy expenses and liabilities by thinking that they are buying assets. Expense and liabilities are more and assets are less. Now let’s take a look at how wealthy lives. They usually take the income of the poor and middle class, and buy assets that produce more income. Their assets produce passive income by which they again invest in asset to become wealthier. So in order to become wealthy you must invest in asset which are true asset and which will produce income for you. 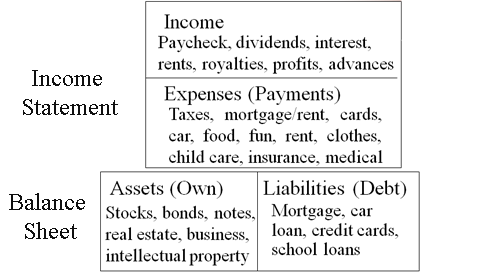 As per Cash flow Quadrant In world we have four types of people. 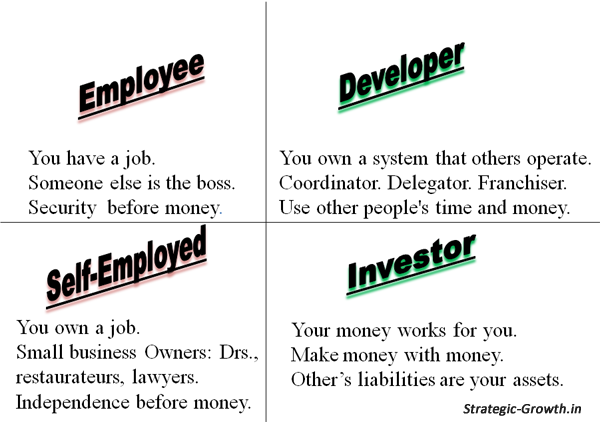 Employee, Self- Employed, Developer and Investor look at following diagram. If you are employee or self-employee you have job security or financial security today but may be you are not securing tomorrow and you are rat race side you may become wealthy but chances are less. What you need to do is start your journey towards becoming either developer or investor to become wealthy. If you are developer or investor who own up system or if your money works for you, you are at correct side and your chances of becoming wealthy are bright. Ultimate essence of becoming wealthy is work towards continuously increasing your asset and passive income. It’s not how much money you make; it’s about how much you keep. Do comment or share if you like this piece of information. I think this article must read and implement to normal person who have dream. Thanks for appreciation, I will make your money work just wait and watch…..